Most of you who read this blog will know that Martyn Sands usually writes the articles that appear here. This month’s blog is a little different. I’m taking over as a guest blogger because this post is actually about Martyn Sands, the man behind South Downs Secure. I’ve been working with Martyn for almost a year now. Over that time it’s become clear to me that he has an extraordinary passion for his work. He is not just incredibly knowledgeable, but he’s also committed to customer service. If you are looking for a custodian for your precious vehicle, rather than simply car storage, then read on, because Martyn Sands is your man. I spent some time interviewing Martyn so that you could learn more about him. When did you first get behind a wheel? My earliest memory of “driving a car” was sat in my father’s lap behind the wheel of 1986 Rover V8 SD1. 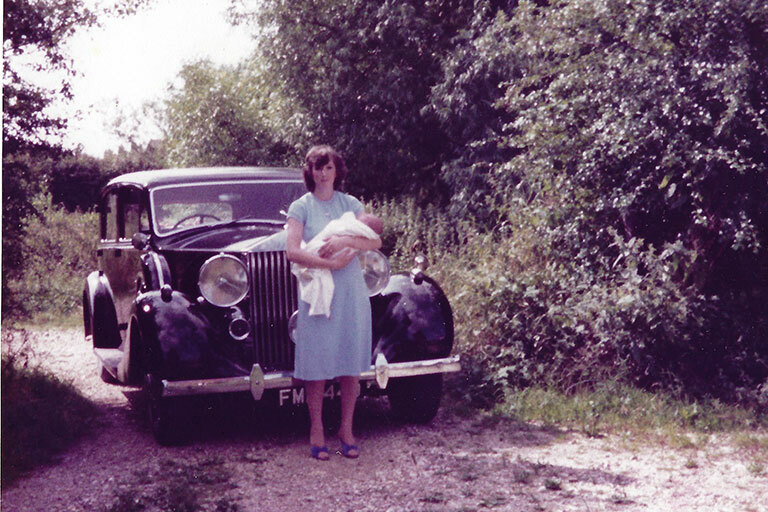 That said, my father did hire a 1939 Rolls Royce Wraith to collect my Mother and me from the hospital when I was born. When I was 14, my late grandfather bought me a cracking little 1978 Austin mini 1000 as a project car. We kept the car on a farm in our village and while I did spend every spare moment learning the hard way about classic car restoration and that dismantling things was the easy part. I also spent many hours practising my driving skills up and down the tracks and yards of the farm, so I would have to say this was my first car. Not much has changed really, as the business daily is a gen1 BMW Mini Cooper. We also have a Range Rover Vogue, all very practical stuff really and not very exciting. What do you wish you were driving now? This is a difficult question as there are a plethora of cars I wish I were driving. If I had to choose one I would probably say a 1965 Buick Riviera Gran Sport. I’m not sure if its the brutish 6.6L V8 or the outlandish styling, but ever since I first laid eyes on one at a classic car show when I was in my early 20s they’ve had a special place in my dream garage. If you took part in James Corden’s Carpool Karaoke what three tracks would you sing along to? Well, singing may not be accurate, but I do have some go to driving songs. The first would be a popular choice I’m sure, “Queen – Bohemian Rhapsody”. Who doesn’t try and sing each part of this masterpiece? The second would be “Johnny Cash – A Boy Named Sue”. My third choice would have to go to “Huey Lewis & The News – The Power of Love” I’m a huge Back to the Future fan. What is your favourite driving route and why? The South Downs offer some incredible driving roads but a firm favourite would be exploring the A272 & A32 around the Meon valley and heading up to Chawton before descending the A31 towards Winchester. You have to drive it to experience it really but it’s just got all the right ingredients for a good drive. Just being immersed amongst some of the worlds finest motor cars and being lucky enough to take care of them. We get to see something new every day and I’m always learning or being surprised. Every marque from Humber to Ferrari has something interesting and unique to offer. Thanks to their wonderful owners we get to be part of this motoring adventure. What are you most particular about at South Downs Secure? I’m pretty particular about everything really. Im always looking to improve our service and facility and maintain the high standards I’ve set for South Downs Secure. Everything has to be right. What’s the most interesting car you’ve ever stored at South Downs Secure? We’ve had quite a few interesting cars through the door since we started. My favourite so far would be a stunning 1929 Bentley 4 1/2L. Just an incredible piece of history and, in my opinion, still a great looking car. What has been your most interesting experience as part of your role at South Downs Secure? Just being at the forefront of its creation and watching our vision come to life has been incredible. It’s been a great start for South Downs Secure and the consistent positive feedback from our clients makes it all worth while. Just recently we traveled across Europe to meet the remarkable team at Noble House Classics and collect an equally remarkable Aston Martin DB5. It was a real privilege and experience to see behind the scenes of the master craftsmen restoring and building a variety of classic cars. There are lots of opportunities and new services coming up for South Downs Secure in 2019. What are you most looking forward to? I’m most looking forward to growing our club experience and private events for our clients, along with our hospitality opportunities. It’s going to be a great year ahead. Want to find out more about how Martyn Sands can help you with secure car storage for your vehicle? Contact him here.